There was a time when I had very high hopes for Satellite Chicken Rice; voted as the BEST chicken rice in Klang Valley according to a poll. But my dream was shattered; hope crumbled like a piece of worthless paper. Aside from the traditional set up; set against the neighbouring juggernaut of a New Ipoh Restaurant Chicken Rice outlet, Satellite did not manage to wow me. And my esteemed impression of chicken rice in KL/PJ was reduced to dust. Then, like how a fallen warrior rises up to his feet, Hong Seng came knocking with a plea to reinstate my faith in chicken rice in Klang Valley. So I was brought here for lunch one fine afternoon by a good Samaritan; promising an experience worthy of an accolade in this Motormouth’s good books. Okay ….. we shall see. And this could be the only chicken rice stall that I am aware of; that requires you to practically queue up at the counter and carry your own plate of rice. Good thing they did not resort to setting a DIY chop-your-own-chicken rule. Barely 1pm, and this place was packed to the brim! On a weekday, try coming before 12pm; if you wish to find a comfortable seat and reduce the time spent lining up and risk getting chicken parts/barbecued pork splattered over your nice shirts. But he was fast. Like a maestro at work chopping up his prized roasted meats, it took us all but 5 minutes before we got our orders and hurriedly rushed to the adjacent vacant table. Be calm, be good and be patient. Of course, on not-so-busy days (like the picture above, seriously), you can ask them to bring your food to your table for you. If say, you don’t want to risk getting your pretty fingers all greased up or bowls of hot soups all over the place. That first experience got me sat up and took notice. 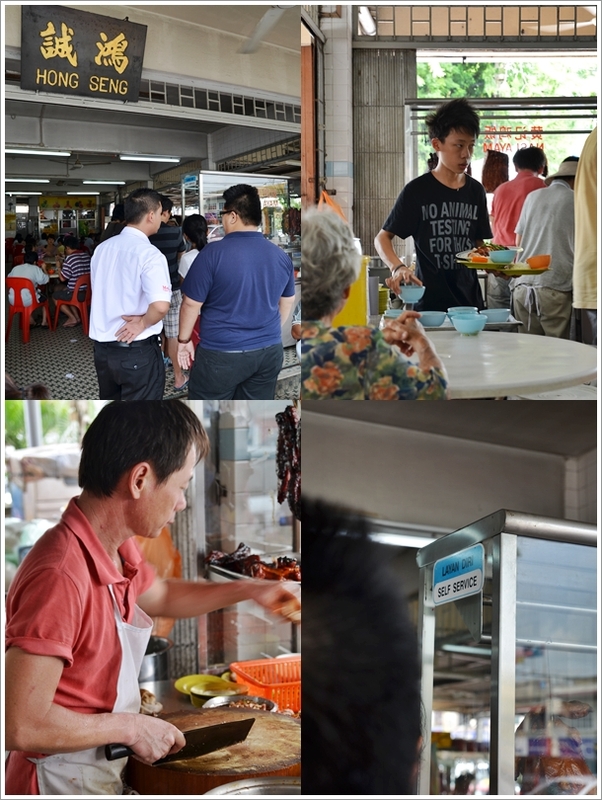 I do admit that I was hesitant initially; seldom seeing people actually lining up for chicken rice on a sweltering hot afternoon and not for take-aways. But one bite into the roasted chicken with crispy skin (which I suspect he or his staff quietly baths the roasted chicken in boiling oil before served to maintain that crisp exterior) and sinking my teeth into the tender flesh, complemented by a spoonful of well-cooked, fragrant rice with a fluffy texture and separated grains, I was sold. More over, the accompanying garlic/ginger chili sauce was fiery hot and tasted so true to its roots (Hainanese roots? ); being a perfect balance of piquant, spicy and robust. No brownie points for aesthetics here; but for less than RM5.00/USD1.70 per portion, you don’t get roasted chicken rice any better than this. At least, by far in my opinion. But lightning can’t be striking the same place twice, right? And so I returned for the second visit almost a week after. With a camera in toll; wanting to capture the action and sharing this with you. Someone told me that Hong Seng‘s char siew (barbecued pork in a sweet sauce) and siew yoke (crispy roasted pork) are wise choices too. Crackling skin with a dense texture of the meat underneath; the roast pork here might not be the BEST but certainly a cut above the mediocre rest. And I had to concur. The “killer” sauce (a sticky black sauce resembling a mixture of black soy sauce, honey + hoi sin sauce) was seen streaking its way across every plate of rice. 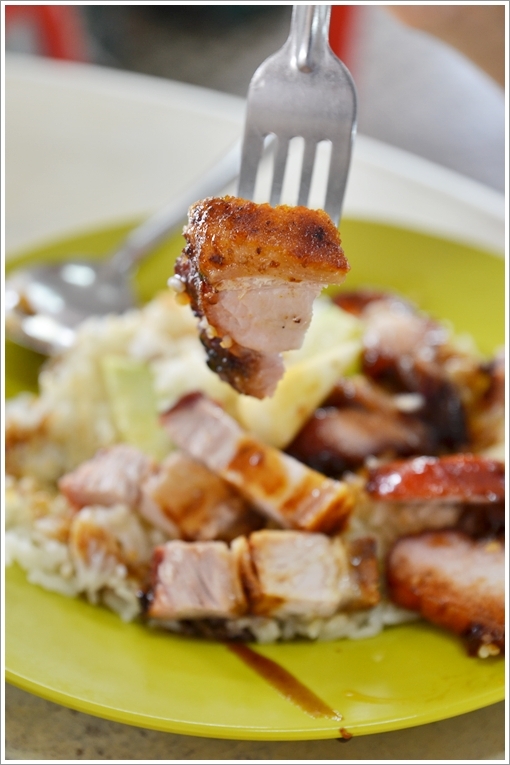 Be it char siew, roast pork or roasted chicken. And although some might not be enticed by the fact that you can eat chicken rice with black soy sauce (in Klang and Singapore, they do), I embrace this delightful combo. Sorry he was out of focus. He froze for a second when turning his back and saw me pointing my ‘gun’. Wait, don’t get estranged ideas. My camera I meant. The spicy chili sauce did the work too. With a predominantly more pungent ginger taste than ever, the sauce was overwhelming according to my dining partner, but I was relishing every bit of it. Good Hainanese chicken rice should come with a homemade, exceptional chili sauce I feel. Although I have no idea whether the owner and his family are of Hainanese origin or not. I was too apprehensive to ask, since they were running their business like clockwork; to inimitable precision and delegation of works. The corner lot in Section 17; near to the wet market. A few doors away from Caring Pharmacy, and opposite of the famous Say Huat Restaurant (Robert’s char koay teow). Only for lunch, from morning until about 3pm. Closed on alternate Mondays. 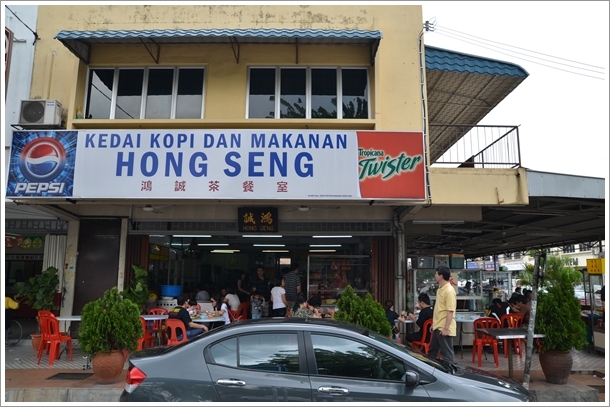 Google Map to Hong Seng. USJ which one?! Gimme the name …. let’s start a chicken rice hunt. Ah. Restaurant Nanking in Taipan – the owner is called Uncle Alex, has good siew yoke, char siew and chicken of course! Thanks neko! Will conduct a hunt soon enough …. when USJ’s not so jammed on weekdays! 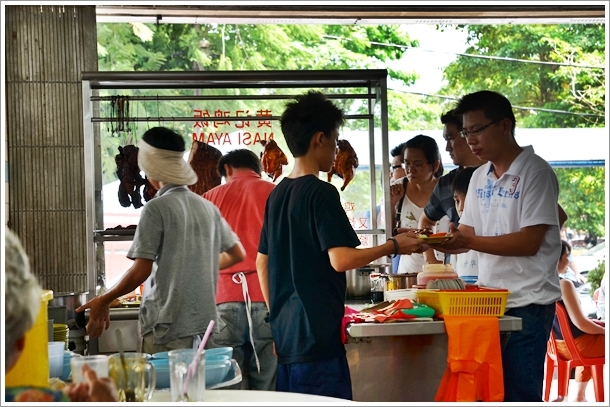 Yeah, though I am tempted to try Ampang’s Loke Yun too; another highly acclaimed one. Hahaha… that one is good! Did you try the “gai choy” or “sour veggie” or whatever it’s called? Did not. For I was not the one lining up during both visits … hehe. Will do so the next round. Then let’s have lunch there someday! there is another really good chicken rice/char siew fan in Section 17, ground floor of the flats next to the Sri Damai school. have you been there? Dinky little shop and the only stall that keeps that shop running is the chicken rice. Happy Mansion ah? No woh … I am very new to PJ (okay, relatively new …), and discovering places like these make my life so much more fruitful. And adapting to the food scene here in KL is so much easier. It is those tall flats next to the primary school facing the bungalows. I think it is on the ground floor of the 2nd block (facing the main road). During office lunch time it gets crowded with working people. I think it even opens on Sat but you have to get there early or else the chicken will run out. But after eating it, you will become very thirsty (I think because of MSG). Thanks TC! I know where now. I just went to My Elephant and Food Foundry, both at Happy Mansion flats. Yeah … I would say so-so char siew (being more like dense pork sausages than real fatty char siew) but try the roasted chicken rice. Seldom do we get crispy skin like this. I tried their siew yoke and char siew today and I must say it’s only average to me. Didn’t try their chicken cos they were in the midst of roasting it..smells good though. If you really want to try a GOOD char siew, the best I’ve tasted by far is from Overseas Restaurant( Amada branch )… Yeah, I know..this may not be the authentic kopitiam surroundings but the char siew is the killer there. Yeahloh, the char siew at this shop was too lean and more like dense sausages. But the siew yoke was okay ah …. crunchy. But I like the roast chicken from this stall for the crispy skin. Overseas in Ipoh also serves not bad char siew, but of course… premium price lah. 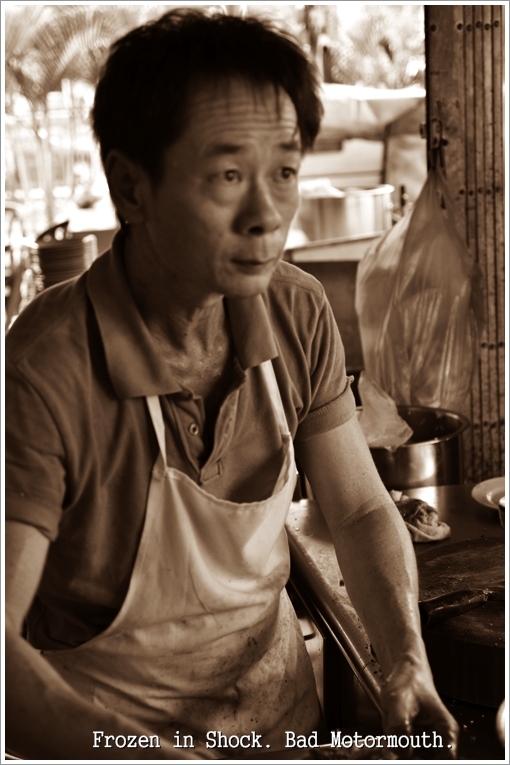 I grew up in this area and he is one of at least three siblings who has sold chicken rice in this area for the last 35+ years. They are definitely local and I am sure they used to live just around the corner. 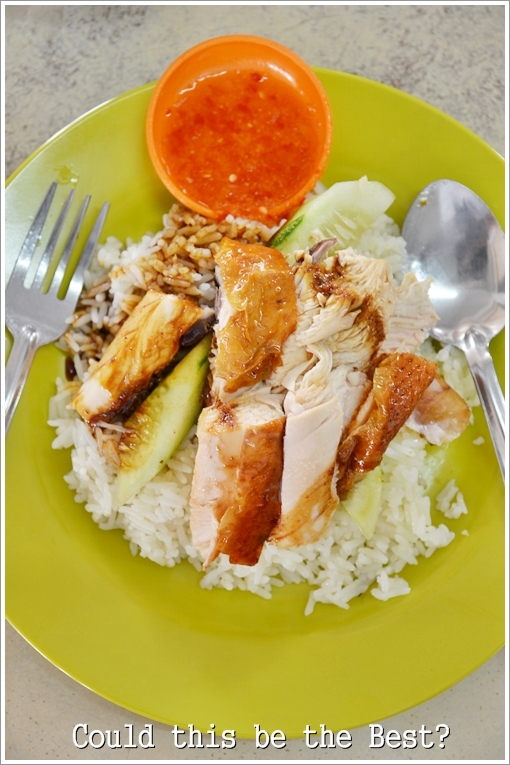 Growing up with their chicken rice, I now judge all chicken rice by their standards! Great to hear that. The other one is the Happy Mansion one? Choon Yien’s the name of the premise, though the service was horrendous. Yeah … I actually read your review before going. Haha … just to be sure. Hi guy, if u guy really food hunter than i shld tell u must go eat e chicken. 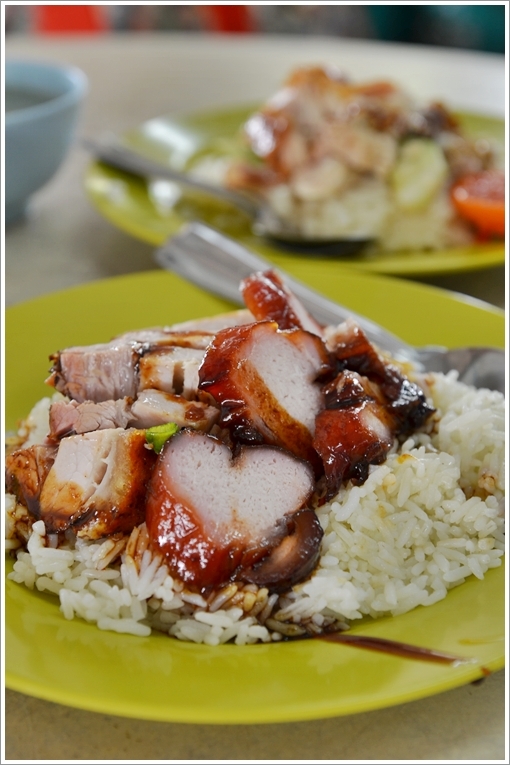 rice- char siew n siu york in paramount garden than u know wat call e best in malaysia. u wont believe such. a high quality. char siew,siu york. n chicken in town ,after u eat i believed. u x need. go others place anymore. add: 63 jln 20/7 paramount garden. name : signature charsiew & ?????? ?go try if not u regret. must go b4 1.30pm fast selling . Hmm…. cannot read the ??? … can translate ah? I think I have a rough idea on where this is. Cannot understand why people line up at this stall. The chicken rice is not so great at all. I would not recommend it to my friends either.